Anita Fine (b. 1935) was raised in New York City and graduated from the Columbia University School of Social Work. Anita married Daniel Fine, a physician, in 1954 and they became “co-activists.” He became Medical Director of the Miner’s Clinic in New Kensington, Pennsylvania, that was owned by the miners and the doctors worked on salary; she worked half-time as Head of the Social Work Program at the Miner’s Clinic from 1959-1988. The Fines’ were humanists and formed friendships with like minded people who became automatic allies in social movements including workers’ rights, welfare rights, women’s rights, racial discrimination, anti-war or anti-nuclear. They protested, organized, collected petitions or lobbied elected officials to promote movement issues. 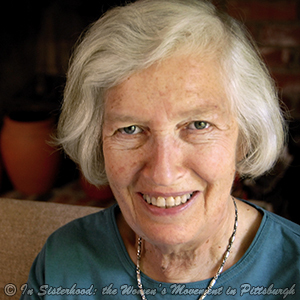 Wilma Scott Heide, a friend in New Kensington, recruited the Fine’s to be founding members of the Greater Pittsburgh Area Chapter of NOW in 1967 and involved Ms. Fine in a consciousness raising group to explore how feminism applied to their lives. Ms. Fine then incorporated feminist principles in the Miner’s Clinic practices and in her social work practice. When the number of miner’s who could be on the picket line was restricted during a strike, she coached wives to “man” the picket line. Later, she trained women to become steel workers and created a counseling program to help them cope with the harassment they received on the job. Anita was a quintessential grassroots activist who could mobilize multiple networks of people on pressing issues in the community. However, she never thought of herself as an activist. She said: “I just thought I was doing what was right” (Fine, 2008). The Fine’s sponsored a Peace Center in New Kensington during the height of the Viet Nam War (1969-1973). Through Physicians for Social Responsibility, they became involved in the anti-nuclear movement and traveled to nuclear test sites in both the United States and Russia where they participated in civil disobedience or educational programs.